Chicken Cheese Rolls recipe by Nazish Arslan at DesiRecipes.com. Cut away the brown corners of each bread(can be used to make breadcrumbs). Mix together green peas , chicken pieces, salt & pepper. Now soak each bread in the water bowl only for few second. Squeez between palms to drain away the water in the bread. Now place a 1/2 cheese slice in the middle of the wet bread. Place 1 tbsp of the green peas and chicken in the middle (elongated shape). Fold around the sides of the bread to make a roll covering cheese and mixture inside. 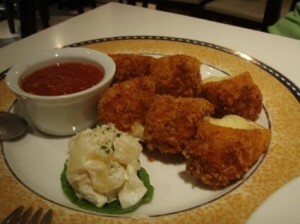 Dip in beaten egg, roll in crumbs and deep fry. well i havent tried it but it sounds good!